My title is actually very misleading. I don't condone rioting, unnecessary violence, or any sort of irrational, destructive, and childish behaviours that were present in downtown Vancouver on June 15, 2011 (or anywhere for that matter). The point of this post is to add to the social commentary by looking at positive aspects that resulted from the riot as well as to discuss the aftermath and any lessons that can be taken away from the experience, with a mostly optimistic point of view. Cynicism is pragmatic and has it's time and place, but optimism encourages hope and even healing. The next day (Thursday, June 16) I was helping a lady when news coverage from the riot appeared on TV. As soon as she saw the images, she made a tiny gasp, turned her back to the TV and remarked that she couldn't watch it anymore. She said that seeing it all unfold felt like a "personal attack" on herself and began to tear up as she said this (her eyes watered up really fast!). I tried to say something uplifting with a smile, and she returned the smile, most likely to be polite, but really, there's only so much time you can devote to dwelling on what you've lost before you can move on. The milk was spilled. Let's wipe it up. There are many who hold the viewpoint that the police should have been better prepared. Regardless of the VPD's professional preparation in managing the crowds and perhaps even the outcome of the Canucks game, this riot was going to happen (the size and scale would just be very different). 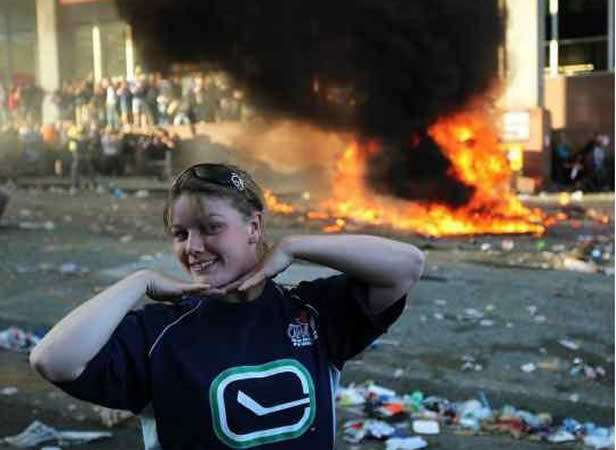 It's pretty much a well-documented fact that the rioters were not "true" Canucks fans. They were misguided individuals who wanted to see mayhem and disorder take place on Vancouver's streets. And it just so happens that Canucks' fans were in that same area and some decided to follow the riot. They wanted to see something burn too. And knowing this should humble us, as Canadians (which is a good thing). Even though Vancouver and other Canadian cities are often highly ranked in magazine publications for being a "livable" city or having a high and well-respected standard of living, it doesn't mean we are superior to other nations. Yes, Canada is a wonderful place to live, Vancouver is beautiful, and the people are friendly, but deep down, we struggle with the same problems that even developing nations struggle with (albeit on a lesser scale). We have troublemakers. We have criminals. We have family and friends who make bad choices in the heat of an emotion-filled moment. We have members of our society who are discontent with their own lives and desire to see other share their discontent and anger. We are all ignorant, selfish, and have an inherent sinful nature. We have to acknowledge that. And we have. 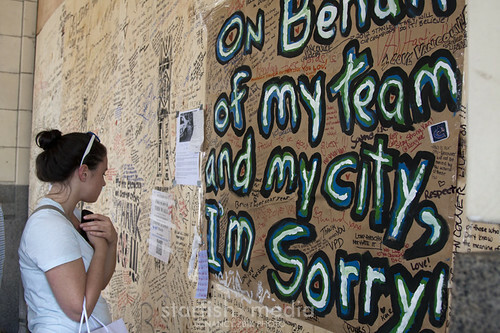 Canucks fans, Vancouverites, and Canadians everywhere have a collective shame over what transpired during the riot. This is a good and proper response. If you've been following the news as much as I have (which is a lot) how many times have you heard people/organizations say, "This is not my Vancouver," or "This doesn't represent my city?" Our Canadian reputation to the world of being peaceful and friendly, was blackened by each car that was set on fire, each pane of glass that was broken, and each item that was looted. If we want to gain back the respect of the world, we must the use the shame to motivate us to never allow something like an infantile riot to bring notoriety to our city. How we might do that will require lots of long term effort. But because it’s just been over one week, short term responses will suffice. The thank you notes that started to appear on an unattended police car on Granville Street, is not only touching for regular citizens, it provides an immeasurable amount of encouragement for the police and the work that they do. The sight overwhelmed Const. Eric Kerasiotis, a member of the VPD’s crowd control unit who suffered a head injury in the riot. Off duty because of the injury, which he wouldn’t discuss, Kerasiotis was returning to the Cambie Street station to pick something up when he noticed the cruiser. He paused to collect himself. Oh, sort of a tangent, but one thing to be thankful about this riot was that it happened in Canada, where we pay taxes and have emergency first responders who willingly respond to crazy situations like these. Despite the abuse and assaults (I can’t imagine being a police officer waking up the morning of Game 7 and thinking, “There’s going to be a mob-like atmosphere downtown tonight and I’m going to get bit by some drunk, dirty hippies”) they stand their ground and do their job. Because of our government system, the army was not called in to mow everyone down with machine gun fire, and there were no fatalities that night. If it weren’t for our laws and court system, it could have been uglier. I heard one middle-aged man converse with my parents that he would have liked to have seen the police be more pro-active. As soon as they saw some hooligans, all dressed in black, start to put on masks or cover up their faces, he postulated that they should have ran up to them, grabbed one of them and “just tazered him for 20 minutes!” As much as I want to agree that that solution could have helped quell the riot, I’m thankful that that is not a standard protocol for police. 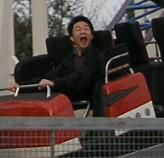 Absolute power can corrupt absolutely and when there’s adrenaline in the mix, hang on to your butts people. Another well documented response that I’m only going to briefly mention are the giant “get well soon” cards, or the signing of the boarded up windows on the shops and buildings that were smashed. I didn’t go down to see for myself, but it seemed like the Bay’s boarded up windows got the most attention. It was a way for the public to collectively respond and “interact” while reading what others felt and thought. Over the next few days, I saw news reports of random people going downtown to give other random passer-by’s free hugs, Timbits (weeee! ), and the Metropolis mall’s glee club went and greeted cruise ship passengers at the Waterfront with some vibrant songs. It was a way to spread cheer versus the spread of hate and destruction a few nights before. As it is being well documented on Facebook groups and sites like these I believe the use of digital and social media as a result of the riot is primarily a good thing because it serves as a deterrent. Don’t do stupid things because anyone can be watching. But it’s also proving itself to be dangerous and comparably negative. I can’t help but compare China’s human flesh-search to ours. Thanks to social media, people have been outing rioters and looters seen in photos/videos posted online (which is a good thing), as well as publishing their personal information and publicly shaming them (which is a mostly a bad thing). In some cases, it’s very much an online mob that is turning on the people who have been “caught,” but they still deserve a fair trial in a court of law, despite how damning the evidence is. It’s troublesome to read some the outrageous insults and death threats because I doubt all these things would be said to the accused/identified if they were standing right in front of us. Peel's principle has been changed in our situation to “The police are the public and the public are the police…as well as judge and jury.” Proverbs says our words can be destructive. Posting a scornful comment is included in that. Finally, the last major thing I want to talk about that was good about the riot, was that Vancouver got to see some light shine amidst the darkness. I’m referring to the people who stood up to the rioters and tried to stop the madness. They were Canucks fans who were downtown that evening. They were regular citizens, untrained in crowd control, security, policing, or whatever. And they knew what they were in the middle of was wrong, and they did what was right. Vancouver Riot 2011 (now called Vancouver Heroes) has a bunch of photos and links to some of their stories. Letters from the Front Lines: Vancouver Riot also has some first hand accounts on those who protected the city (paid and un-paid) and who choose to remain unnamed and unrecognized for their actions. Shanna Selinger was named. She stood up to rioters who were trying to break into a liquor store. The women in the video below who were protecting their BMW are unnamed. If it is indeed their car, they were their own good Samaritans because the mob surrounding them were brainless. When I see pictures and video snippets here or there, I have to try and put my judgment aside. I try, I really do. If I was there, what would I have done? I really hope I would have done the right thing, but assuming I was overtaken with my adrenaline, would I have been swept up in the silliness and kicked at an already broken window? Would I have grabbed a bag of chips from a pile that was thrown outside the doors of a shop by looters from the inside? Would I have posed in front of the riot police or a burning car for a picture? Would I be cheering along with the crowd as we see a car being flipped over? If I did any of these things, would I admit it? Would I admit it if I was seen in photos or videos taken at the time of the incidents? What would I do if someone outed me and posted all my personal information, address, etc online? We see the need for justice and we know there’s a need for compassion, but how do we appropriately balance the two for long term healing? The best thing about this riot, whether its politically incorrect or not acceptable, is that Vancouver needs Jesus. If we don’t want this to happen again, the hearts and minds (especially of young people….the amount of high school kids involved? wow…) need to be changed and influenced by biblical principals. And that starts with knowing God’s true love. This is not another Christiany cop out answer; this is real. To end this ridiculously long post, I will quickly mention that although trivial, we also learned from the riot that buying insurance is a good idea and this edited clip with Alfred being obsessed with tangerines is stupid, but a happy way I will choose to end this post. Consider it your reward if you actually read this whole thing. Maybe I should send out more floppy boxes….hehehe. Wow Tim! Excellent post and well written too. One thing that has me thinking long and hard regarding the riots was where the watchmen fell down. Listening to the prophetic voices around Vancouver after the riots was an interesting perspective. The riot starters were the same group that reportedly were trying to start protests last year during the Olympics. The Olympics were covered in prayer and not just by Vancouverites and Canadians but from all over the world. I believe that some of the reason for the riots was simply that the watchmen weren't watching and we were unprepared (as in prayer) for the evening. God is at work in our city, which means the enemy is at work too. and hmmm, you bring up good points. i remember vividly during game 7 of the chicago series praying silently in my head for a win during OT. i remember praying early in the day of game 6 of the boston series asking God, whatever happens that night that the outcome would be for His glory. and we lost. and i was ok with that. ...but during game 7 of the boston series, all i prayed for was a win for us. and then only when i saw the rioting on tv, then i prayed for safety for the police, and for everything to be resolved quickly.